Patrick Lacey is an author who claims to have been born and raised in a haunted house…Hmm, sounds like a good start for a horror author! 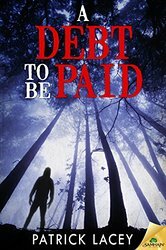 His novella A Debt to be Paid published by Samhain Publishing, shows that the house indeed must have had some influence on him. The story starts with a mother and her daughter on the run from the unknown, something only the mother can see. Flash forward to the present, and we find the daughter Meg now an adult, trying to make a fresh start of her life. But, as we all know, nothing comes easy. Meg is eking out a meager existence, working at a bank, living alone, and trying to forget the past. One day while working she receives a phone call that is catalytic to what’s to come. Strange things begin to occur, glimpse of shadows, feelings of being watched. Is she going crazy, becoming her mother? As things begin to come to a head, Meg seeks out her mother for answers. Her mother, Gillian has been living in a mental institute for the past 20 years, labeled schizophrenic. Will she be able to break through her mother’s unresponsive barriers to get help, or will she be doomed to an eternity of madness? Lacey weaves a good tale here, I got a bit of an “It Follows” vibe from it. He keeps us guessing at the outcome, and is able to raise a few goosebumps. But, I do feel the story felt a bit rushed at the end. I wish there was a little more depth to the reconciling of mother and daughter, and to the way things tie together with the past and present. That said, this is a story worth taking a look at. Lacey also has quite a few short stories published, you can find them included in various anthologies such as: Bleed, Widowmakers: A Benefit Anthology of Dark Horror, and Dark Harvest: A Collection of Dark Horror, just to name a few. Do check them out, he’s quite the storyteller! You can pick up your copy of A Debt to be Paid here.